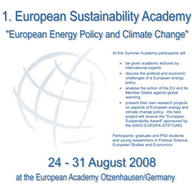 As part of its work on “EU Energy and Climate Policy”, the Institut für Europäische Politik (IEP) organizes, in close cooperation with the European Academy Otzenhausen (EAO) and the University of Trier, the annual “International Summer School on Sustainable Development”. 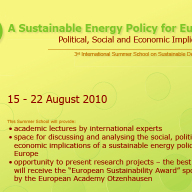 The one week-long Summer School covers different topics relating to European and International policies on energy and climate protection. It takes place at the renowned European Academy Otzenhausen (www.eao-otzenhausen.de), a place known for its excellent working and housing conditions. The event is intended for graduate students, PhD students, young researchers in Political Science, European Studies and Economics and young professionals. It gives participants the opportunity to exchange ideas with renowned academics, high civil servants and politicians closely involved in European policy-making. Furthermore, the programme includes time for participants to present and discuss their own projects, thereby broadening and furthering their own research. Besides lectures and presentations, the Summer School offers a large range of recreational activities as well as several excursions throughout the region. Working language is English.